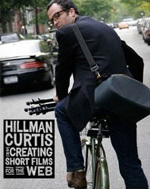 Part retrospective, part therapy, part tutorial and part primer, Hillman Curtis’ latest book, Creating Short Films for the Web is an exploration of the author’s cinematic lust and forays into the medium, delivered in a comfortable read that is most often engaging despite the heavily detailed anecdotal and technical bent of the author. Curtis writes about nine of his digital video projects — it is important to acknowledge “digital” as a key word in this book, since it is a very affordable medium to dip one’s toes in without losing the thousands of dollars usually spent on traditional video — and spares no details, chronicling most aspects of each from concept to completion and is equally happy to include mistakes, successes, discoveries and failures. The book has an interesting dichotomy between the objective and subjective; going from the technical aspects of setting up lighting, choosing the right microphone, writing (or not writing, in most cases) a script, to the sometimes mushy sources of inspiration that drive Curtis, the peppered lessons in design and his enjoyment of turning off the lights, opening a bottle of red wine and listening to his iPod. The content at times feels like too much information and romanticism with the subject, yet it shows the highs and lows of doing any kind of creative work paired with the mundane and special moments of creating that most of us actually go through but rarely talk about. Curtis’ openness in this book is both a plus and a minus, so depending on how empty or full your glass usually is you will swallow it differently. The objective and technical side of the book is excellent. Curtis is not a filmmaker by training or education; what he has learned has been through trial and error and simply by doing it. And wanting to do it. So his explanations come off as buddy-tales of caution and discovery, oozing optimism for anyone interested in following their digital video dreams. When Curtis talks about technical terms and equipment, they are presented in easily understood and graspable language, many times relating it to design principles. It is in this area that the book really succeeds, as a friendly, professionally tested DIY source — specially since you can see all the final movies from the book on Curtis’ web site. In a way that project was inspired by Curtis’ Artist Series movies, which if you have seen, appear absurdly simple on any given viewing, presenting a feeling of “if he can do it, I can do it”… This book demonstrates how hard it is to make those movies look and feel so simple. And how everyone could do it. i am really excited to see this book. i've shared the links to the movies so many times as an example of what we do / why we do it. the victore, scher, sagmeister, and glaser movies are all *get right to the core of life* vignettes, they're so fantastic. I always stop by Hillman's site to check out anything new. He has a great feel for these shorts and I'm interested in doing something similar with composers and musicians I work with. He seems to be a pretty friendly guy and even answered an email I sent asking about microphones. When I got this book a month ago I started on it,and didn't put it away until next morning. Very inspiring! It finally got me started on some documentaries I've had in mind for years. the book was extremely useful as an art reference, but next to useless as a Flash reference. It did inspire me while creating a few projects this year, so when Jan Kabili emailed me about an interview by Inside Mac of Curtis that was online I found myself needing to tell you to check it out. Curtis is known for experimental and commercial Flash based design going back for a number of years and currently he is working on a new video project. i just ordered a copy of this book from amazon...great timing because i'm working on a short film presentation for our aiga chapter's annual meeting in june. i'm hoping that this book will help me avoid certain pitfalls throughout the process (along with collaborating with a film student who actually knows what he's doing). i'm crossing my fingers that all goes well!